Click here for Fitted Sheets, Safety Sheets and Crib Blankets for Playyards, Compact and Full-size Cribs/Toddler Beds and Cots. All Mattresses are 52"L x 28"W - Thickness as Indicated. Crib Saver™ Crib Covers Commercial cribs receive most wear and tear while in storage. Extend your crib’s life and protect it from dirt, dust, bumps and bruises with our heavy-duty, nylon crib cover. 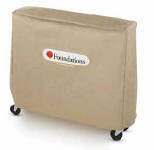 Sizes to fit compact and full-sized folding cribs in folded position. Mattresses fit inside. there is no stronger evacuation system available in the market today. Lifetime warranty. Mattresses can not be returned due to sanitary and safety concerns.